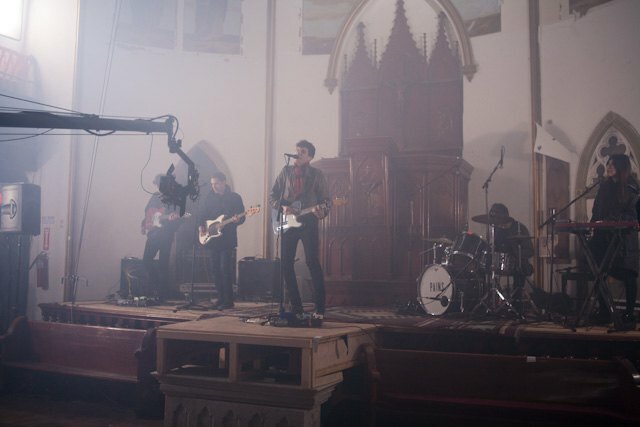 We’re not sure if anyone from Bushwick will ever make it to heaven, but one thing we can say for sure - praying is a lot easier with The Pains of Being Pure at Heart rocking at the church. 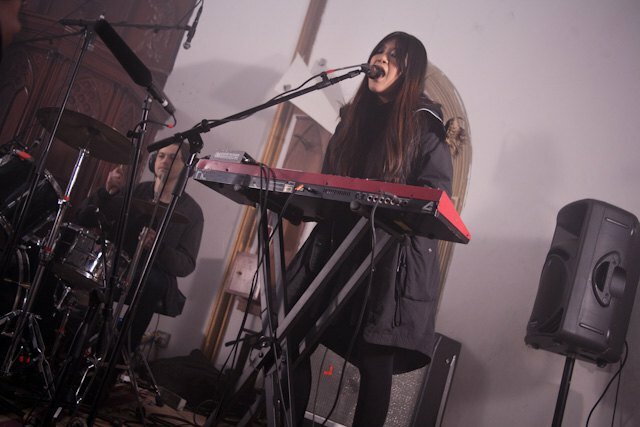 This past Sunday, MTV Iggy came to Bushwick to record an episode of its Artist to Watch series, and Bushwick Daily readers were invited. MTV Iggy is a cool division of the MTV family that specializes in highlighting up-and-coming indie musicians from all around the world. 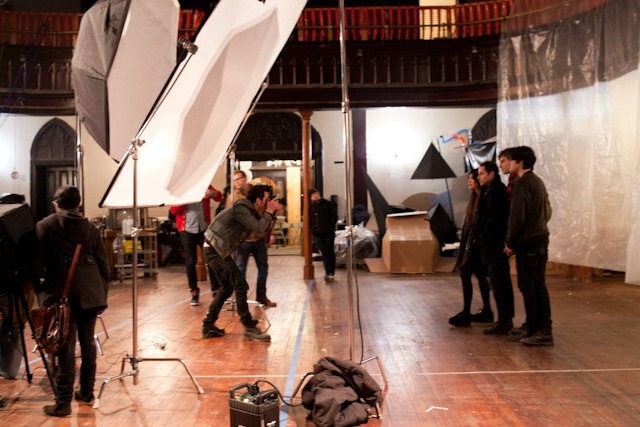 With an incredibly flourishing indie music scene, Bushwick was clearly a great fit for MTV Iggy and so was the famous church at 626 Bushwick Ave, where the shoot took place. 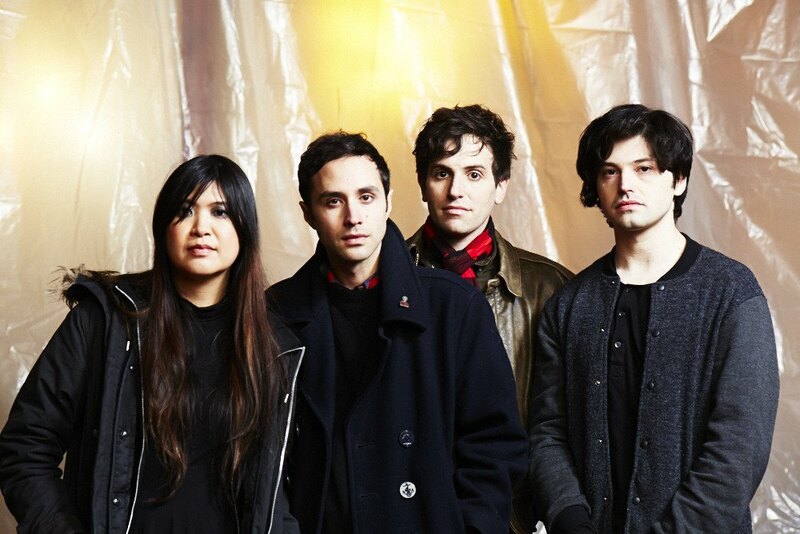 The Pains of Being Pure at Heart comprises of singer/guitarist Kip Berman, drummer Kurt Feldman, Alex Naidus on bass, and Peggy Wang on keyboard and vocals. The band performed some of their biggest hits, like "Young Adult Friction," as well as their unreleased song "Until the Sun Explodes." 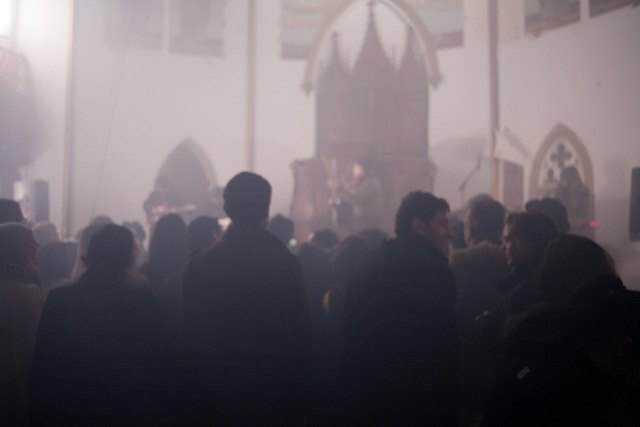 The sacred environment of an old church seemed to be a really good fit for the noise pop quartet. 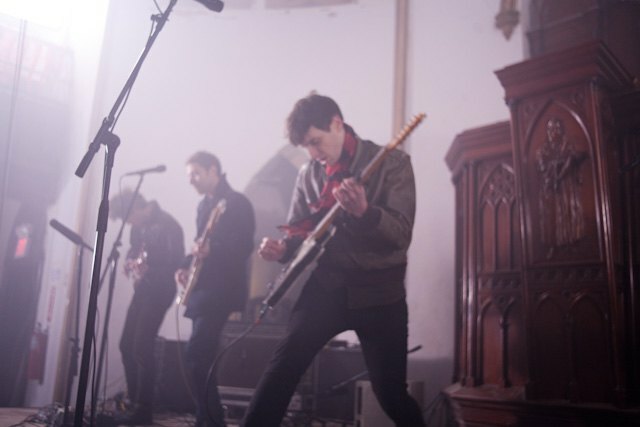 The Pains were energetic, playful and created great excited energy among the jumping audience. Alex: Good. A little tired. 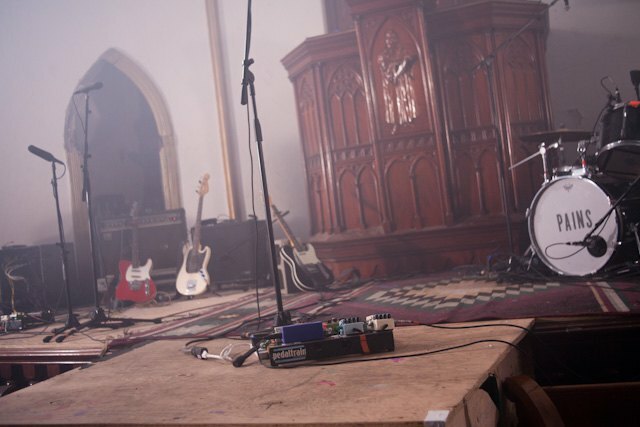 How did you like playing at a church? 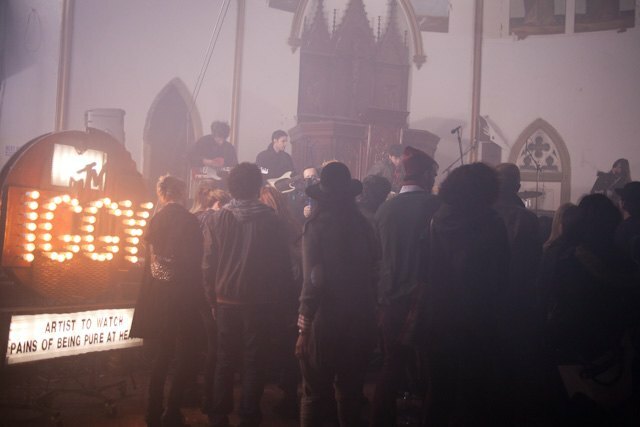 Have you ever played at a weirder location? Kip: What do you think was the weirdest? Alex: The cider brewery in Spain. There were these huge casks…oh, and the cave in Padova - in Italy. That looked like straight up from Lord of the Rings. Kip: Oh yeah! But this is probably the most haunted place. Have you noticed any paranormal activity? 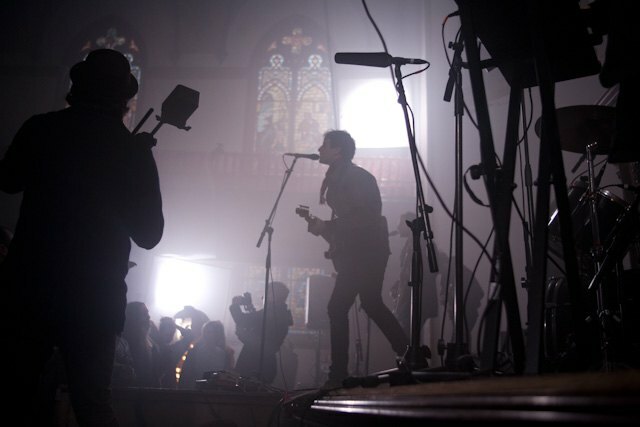 I heard there are ghosts in the church. Peggy: Really? I am glad I didn’t know this before! Kip: Maybe when they show the video the ghosts will appear. We will be like that guy wasn’t there. That guy must be a ghost! You guys all live in Greenpoint, well except for Peggy who lives in the East Village. Do you ever get to hang out in Bushwick? Kip: Didn’t we record our first album in Bushwick? Kip: 16 Varet. Our friend had a little recording studio there. That is cool. What year was that? 2007 or 2008? Kip: We recorded it in 2008, and it came out in 2009. Kip, you also lived in Bushwick, right? Kip: Yeah, when I first moved to New York, I lived right off the JMZ train on Myrtle/Wyckoff. That was 7 years ago. What’s your favorite hangout spot in Brooklyn or NYC? Alex: I like to play ping-pong at this really awful place in Greenpoint called Risque. I just like ping-pong and it’s down the street. Plus it’s really cheesy and because it’s cheesy no one is ever in there. So it’s really good for ping-pong and cheap beer. It's strange to call it my favorite place but it is something that came to my mind. I don’t do too much hanging out at bars anymore; I just hang out at my apartment. Alex: We are on tour a lot, so we just like to chill when we’re at home. It’s hard to have a regular hangout spot when you’re away like 8 month of the year. Kip: I like to hang out at a bar called Pit Stop. My friend Art lives upstairs from the bar and they all know him there. It is really fun to go there and they also have really cheap drinks. And you can watch sports on TV if you want to. Peggy: Hmmmm…7A. I like their salads. What about your plans right now? Do you have anything exciting coming up? Kip: We’re recording some demos right now, so hopefully we’ll get to make a new record in spring. That’s probably the most exciting thing right now. 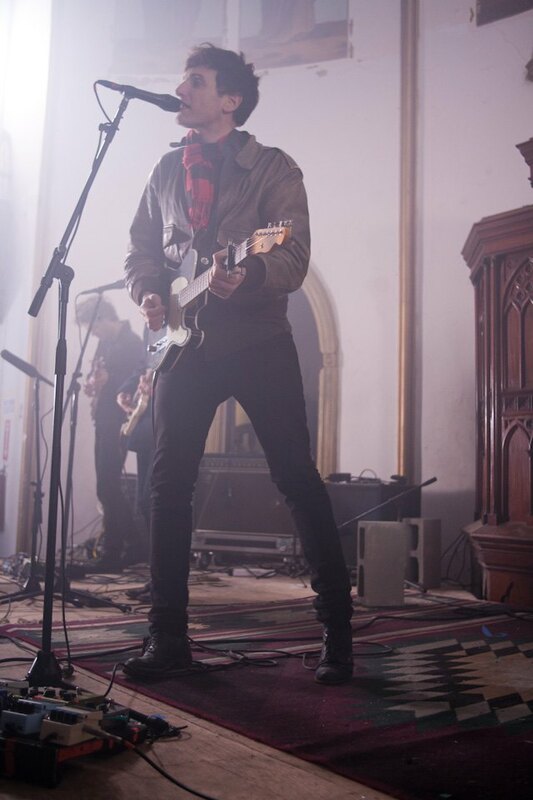 Alex: We’re playing a show on Thursday at 285 Kent. What do you think of today's Bushwick? Is there a message you would like to pass on to our readers? Peggy: Like a week ago, I tried to eat at Roberta’s because we were at Newtown Radio. But they told us it was going to be a 3-hour wait. Kip: The message for Bushwick is: It’s a long wait for pizza but it’s worth it. More photos at MTV Iggy.